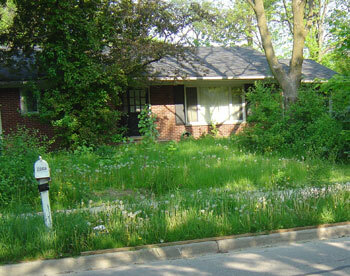 The front lawn of Stanislav Voskov's Pittsfield Township home with dandelions gone to seed. Is it natural landscaping, or just unkempt? This photo was taken in May of 2007 by a Pittsfield Township official. No citation was issued at that time., but one was issued to Voskov in June 2008 for violating a township property maintenance ordinance. If I had to pick sides, I guess I’m anti-lawn. Come summer the small patch of land in front of our Ann Arbor home turns into a micro-garden of pole beans, potatoes and tomatoes, with orange cosmos towering in the narrow strip between the sidewalk and street. Much of our back yard is filled with an herb garden, flowers and, of course, a teeter totter. So when Doug Cowherd of the local Sierra Club chapter contacted The Chronicle about a dispute between Pittsfield Township and a homeowner who’d been issued a citation over the condition of his yard, I was prepared to sympathize with anyone who challenges the suburbian status quo.